Sim card recovery software easily finds and restore deleted text messages and phone contact numbers from your mobile cell phone. 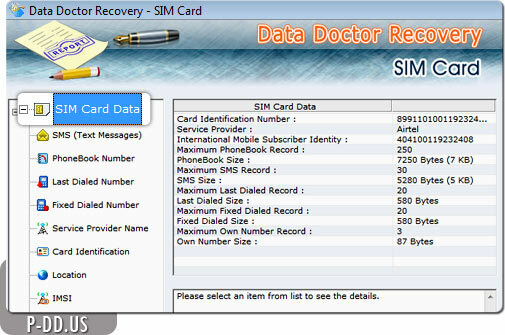 Advanced sim card data rescue tool support recovery of text message and stored contact numbers in the easy way. Easy to use utility accurately backup and restore all the lost data from SIM card of any mobile network (country/service provider) and does not require any technical skills to operate the software. Software performs Data Recovery with the help of USB simcard reader (Support any phoenix standard or PC/SC Standards based sim card Reader) and allows you to view information including deleted contacts numbers and text messages. The advance feature facilitates generating the report which allows viewing date and sending time of text messages. The advance feature facilitates generating the report which allows viewing date and sending time of text messages. Recovers all deleted text messages. Restore deleted phone book contact numbers. Retrieve ICC identification number printed inside the sim card. Data recovery support to all major sim (GSM) service providers. Data Recovery within minute time.